The twenty-sixth president of the United States was also a world-renowned hunter, conservationist, soldier, and scholar. In 1908 he took a long safari holiday in East Africa with his son Kermit. Roosevelt describes the excitement of the chase, the people he met, and flora and fauna he collected in the name of science. Long out of print, this classic is one of the preeminent examples of Africana and belongs on every collector’s shelf. 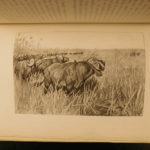 African Game Trails An Account Of The African Wanderings Of An American Hunter-Naturalist by Theodore Roosevelt; with illustrations from photographs by Kermit Roosevelt and other members of the expedition, and from drawings by Philip R. Goodwin.